We seem to eat more Caesar salads in the fall and winter months when the tomatoes and other salad veggies are not so great, so I’m always testing different chef’s recipes and maybe one day I will have just one as my go to recipe, but not today so I’ll share another recipe that I found and enjoyed from Geoffray Zakarian. He suggests serving whole Romaine leaves on a platter, not torn to pieces drizzled with the dressing, not tossed with the dressing and guests are urged to use their fingers pick up the lettuce and take bites. Well I can tell you that idea didn’t go over well with Mikey and he used a knife and fork. We were having pizza so I could have actually gotten away with no knives and forks on the table. Didn’t happen, but I think that the lettuce stays crispier when served whole instead of torn into pieces. 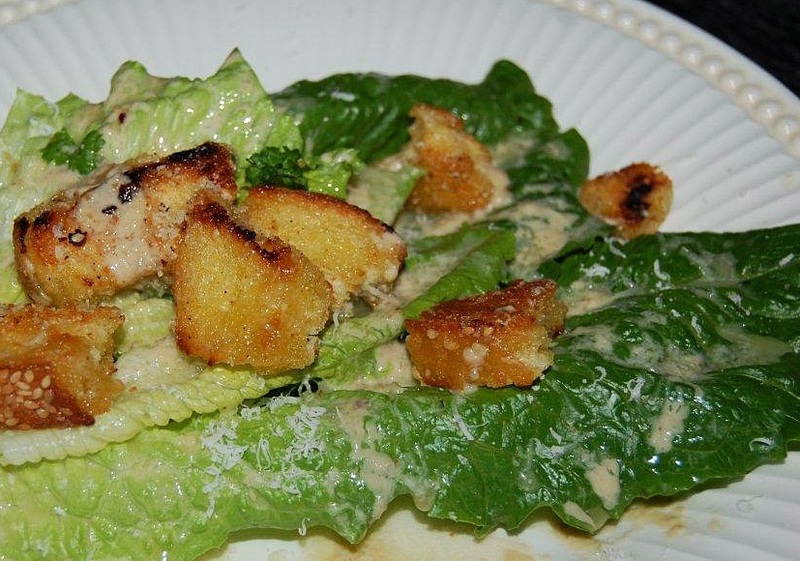 I’ve always made my own croutons done either in the oven for large amounts or in a sauté pan so the pan method was not new to me, but what was new to me, was just tearing the bread into chunks instead of cubed…perfect and adds to the casual aspect of his version of a Caesar salad. 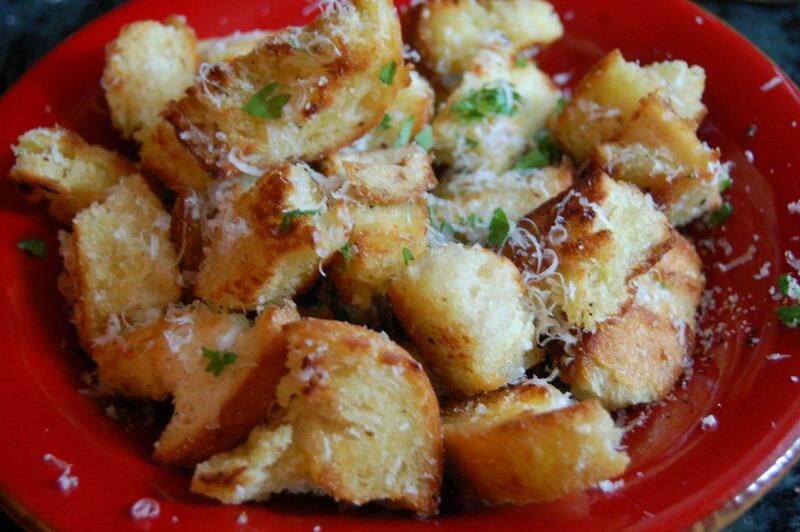 Simple, I know and perfect croutons with a crisp exterior and softer textured center. Another reason that I liked this salad was the fact that he used white anchovies in the dressing, not sure if his were the salt packed anchovies, but that is what I had and I added only 4 cleaned and deboned to the dressing. For the croutons: Heat the olive oil over medium-high heat in saute or frying pan. Once it is hot but not smoking, add the bread pieces and stir until the bread has been evenly toasted and is golden brown. Season with salt and pepper. Place the croutons in a bowl with a lining of paper towel to drain the oil. Immediately toss the cheese into the croutons, followed by the parsley. Store at room temperature. For the dressing: Combine the cheese, roasted garlic, vinegar, mustard, anchovies and egg yolk in a food processor. Blend until a smooth paste has been formed. If necessary, add 2 tablespoons water to ensure it is a smooth paste, and not clumpy. With the machine running, emulsify the oil into the paste in a steady stream. Add more water or vinegar as necessary, depending on how loose or acidic you prefer the dressing. 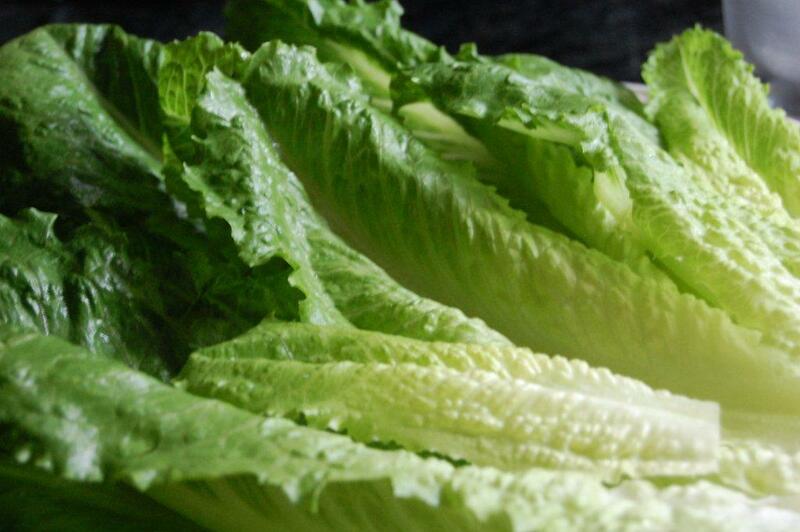 To finish the salad: Place the lettuce leaves onto a serving platter and drizzle the dressing on top. Season with salt and pepper. Using a peeler, shave large pieces of the Pecorino cheese over the lettuces, followed by the croutons and anchovies if using. Posted on October 19, 2012 October 20, 2012 by ibbeachnanaPosted in Salads and DressingsTagged caesar salads.